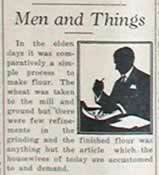 For some years, the column “Men and Things” appeared regularly on the editorial page of The Rutherford County Sun. 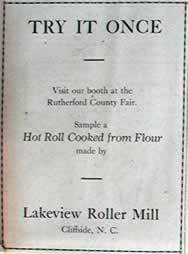 This particular one, profiling Cliffside’s Lakeview Mills, which made flour and corn meal, appeared on May 26, 1927. In the olden days it was comparatively a simple process to make flour. The wheat was taken to the mill and ground but there were few refinements in the grinding and the finished flour was anything but the article which the housewives of today are accustomed to and demand. The making of the flour now-a-days is a complicated and exact process, one which requires modern machinery and technical skill as will as trained judgment. A trip through a present day flour mill is not only interesting but also instructive. There are several such plants in Rutherford County and recently the Lakeview Roller Mills, on the western edge of Cliffside, and standing high above the pretty Hill’s Creek, was chosen as a means of learning just how flour is made. The Lakeview Mills is not a large plant but it is a thoroughly modern one and is equipped with machinery of the latest and best type. Higher up on the hill stands the storage house in which the wheat, as it is received from the railroad cars, is placed. The siding is about six hundred feet in length and connects with the Cliffside Railway. The storage house has a capacity of six to seven thousand bushels of wheat. As the grain is needed it is brought to the receiving bin which is on the ground floor of the mill. From this temporary storage space it goes to the receiving separator where the wheat is given its first cleansing. The next step is the milling separator where it is cleaned again and then it goes to the carter disk where the cockle and oats are removed. From this machine it is transferred to the scourer which not only cleanses the grain once more but also polishes it. After this it is placed in the tempering bins where it is allowed to soften for eight to twelve hours. It is unusual to find tempering bins in a small plant but the Lakeview Mills have them as they put out on the best grades of flour, and it is the softening of the wheat which plays a part in the final quality of the finished product. After being softened the grain is taken to the brush machine which gives it the final cleaning. It is ready now for the break rolls, which as the name indicates, breaks the grain into small pieces and they pass through the sifter and twelve screens and then through three additional rolls. Each time a certain amount of flour is obtained and when the third roll has been reached the hulls and bran have been removed. Then come the five middling or reduction rolls and through them the wheat passes, and a certain amount of flour is made each time. There are four middling rolls. The flour is now ready for the redressing machine and then it is bleached to obtain the whiteness demanded by the buyers. An electrical bleacher is employed; it has the advantages of doing the work more quickly and with less expense. When the current is turned on an arc of ten thousand volts is formed and this vaporizes instantly a chemical which is blown through the flour as it passes through the agitator. The bleached product now passes through a hopper where it is weighed and the necessary ingredients to make self rising flour are added. 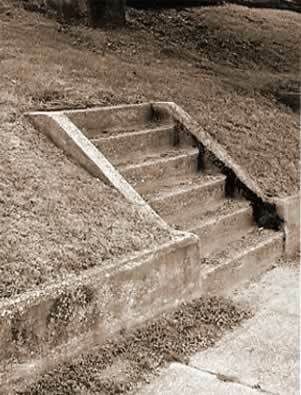 It is then ready to be sacked, twenty-four, forty-eight and ninety-six pound sacks being used. A certain amount of phosphate is added to all flour to make it bake better. Of course each flour mill has its own brands which are known to the public by different names. The Lakeview Mills have five kinds of flour; Magnolia, Perfection, Rising Tide and Pride of Lakeview, the last two are self rising flour. In the main building of the Lakeview Mills is machinery which cost over ten thousand dollars a year or so ago. Three stories in height it is about forty feet wide and sixty feet long. It houses not only the flour machinery but also contains a corn mill plant and the means of grinding whole wheat flour, or as it often called, Graham Flour. Electrical power is used and there are three motors; the large one of sixty horse power is used for the general work and the two smaller ones for special machines. The hulls and bran obtained during the making of the flour are ground and made into feed. Cleanliness is the watchword of the mill. The capacity of the plant is about seventy-five barrels of flour a day. Mr. J.P. Carpenter is the manager. Mr. Odell Freeman is the miller and the other two employees are Messrs. Tilden Queen and Shirley White. They are capable and obliging, and the products of the mill speak well for their capabilities. Most of us, when we hear the term Lakeview Mills, think of the old grist mill that preceded the roller mill that most of us remember. There might have been much more to the Lakeview name had R.R. Haynes lived longer, for on May 25, 1916, less than a year before his death, he and his sons filed for a certificate of incorporation for an entity named Lakeview Mills that was a far more ambitious concern than a mere feed and flour mill. It went on and on, hogs and chickens, livestock, milk, cream and ice cream, marble and granite. It was either a catch-all document to cover any contingency or a fantastic plan to expand the Haynes empire. A few things happened that prevented the Lake­view Mills plan from taking shape. The major event was R.R. Haynes death the following February. Then, within months, before his son Charles, the successor, could catch his breath, war broke out. Soon after that, the Great Depression put the nation on its knees. At some point during all this turmoil the grandiose Lakeview plan was put in a drawer and forgotten. This article first appeared in the Sep-Oct 2007 newsletter of The Cliffside Historical Society.